1919 The bridge at Chateau Thierry over the Marne River where the American Army stopped the German advance. This print is by Schultz print AEF 191 and property of American Legion Post 223. 1919 The Argonne Forest from the American front lines, near four De Paris. This restored print is by Schultz print AEF 191 and is the property of Post 223. 1919 Old glory flies from Ehren Breitstein Fortress where the Rhine and Mosul Rivers meet Coblenze, Germany. Thie restored print by Schultz printAEF 126 and is the property of American Legion Post 223. 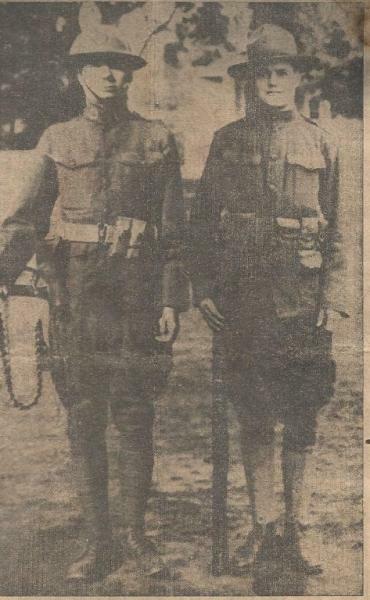 This Photo is the property of the Shippensburg American Legion Post 223 World’s Great War for Democracy photo with General John J. Pershing. In June 1903, Pershing was ordered to return to the United States. President Theodore Roosevelt, taken by Pershing's ability, petitioned the Army General Staff to promote Pershing to colonel. 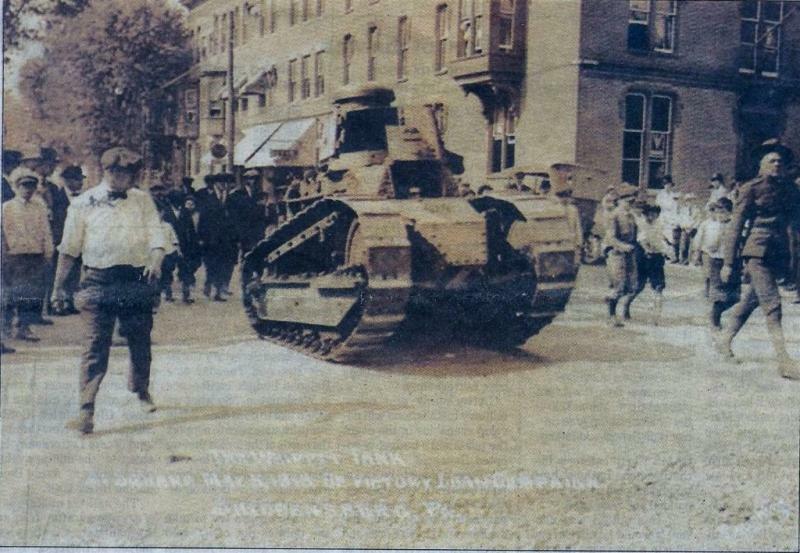 At the time, Army officer promotions were based primarily on seniority rather than merit, and although there was widespread acknowledgment that Pershing should..
May 5, 1919 World War 1 Whippet Tank on square May 5, 1919 on Victory Loan Campaign at Shippensburg, Pa. The Medium Tank Mk A (also known as the "Whippet") was an armored vehicle specifically designed to exploit breaches in the battle lines created by heavier lozenge-shaped combat tanks such as the Mark 1 series. The Whippet went on to become the most successful British tank of the war and was used to spearhead assaults,..
As World War I was drawing to a close, the men and officers of the American Expeditionary Force in France felt that they would like to have a way of maintaining the bonds and friendships that they had made during the Great War. They had worked together and supported one another in the battles of the Argonne Forest, Ypres, and the Marne. They were searching for a way to continue this fellowship when the returned.. The members of the Post met in the Redding Studio on North Earl Street to organize as a permanent post. The following officers were selected for the year. George H. Stewart Jr. Post commander, Lee M. Hale, vice-commander, Charles A. Kent, adjutant, Linn Murray finance officer and Lawerence Warren chaplain. 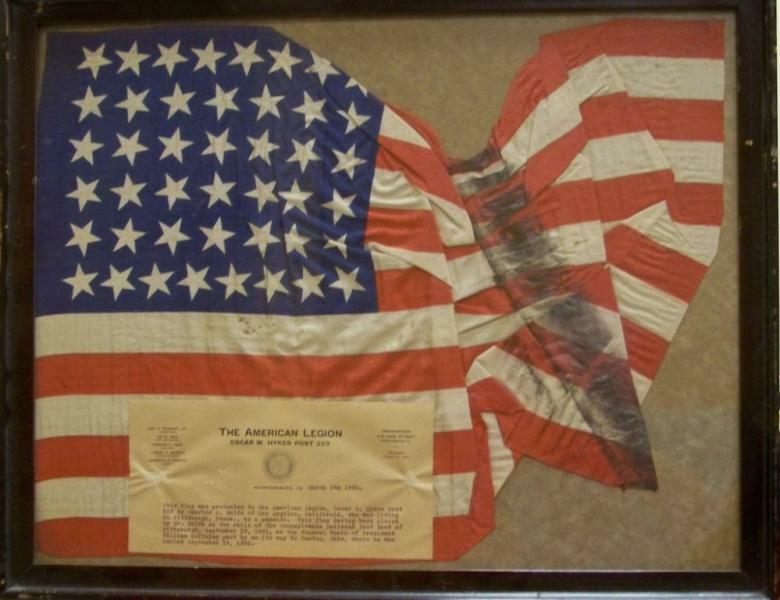 The annual dues were set at $5.10 $1 to be paid to the national organization and .50 to the state organization, and $3.60 to the..
March 9, 1920 This 48 star flag was presented to the Oscar M. Hykes American Legion Post 223 March 9, 1920 by Charles A. Wolfe of Los Angeles, California, who was living in Pittsburgh. Pa. as a memento. This flag having been placed on the railroad just east of Pittsburgh, September 18, 1901 as the funeral train of President William McKinley passed by on its way to Canton, Ohio, where the President was buried September.. 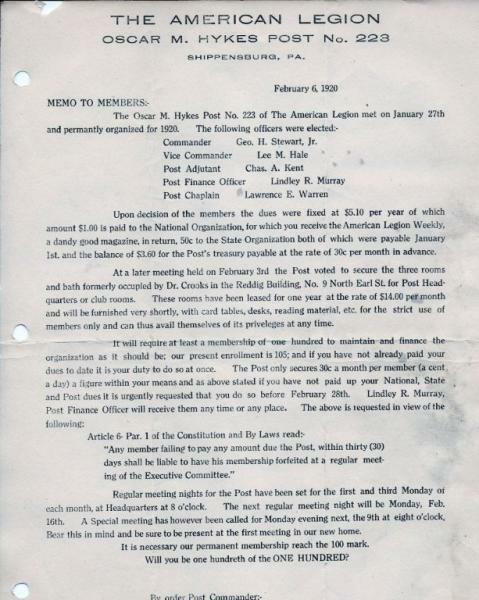 In June of 1920 in Allentown PA at the Pennsylvania's first formal American Legion convention, the American Legion Auxiliary, Department of Pennsylvania was established. 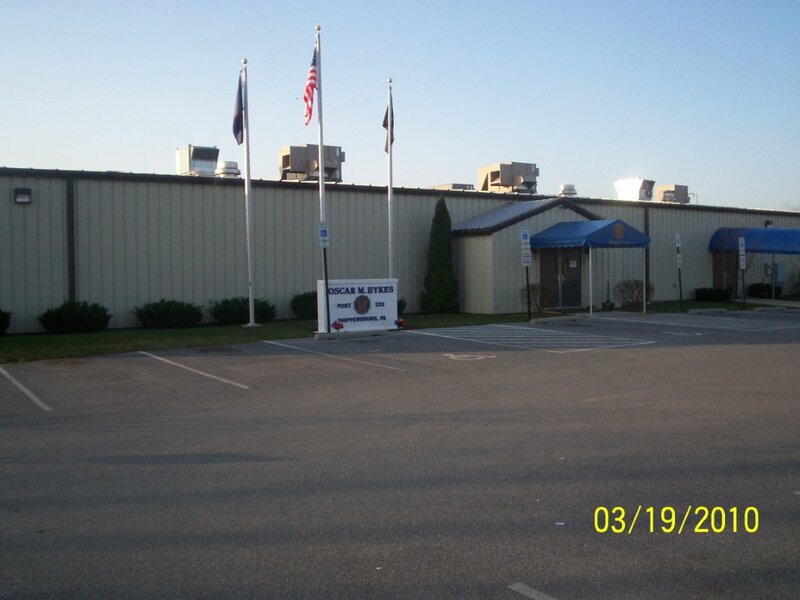 Their charter was granted from the temporary National Headquarters In New York. A memorial service was held in the Church of God at which time the enlarged photos of the nine veterans of Shippensburg who were killed in action or died of disease were unveiled. 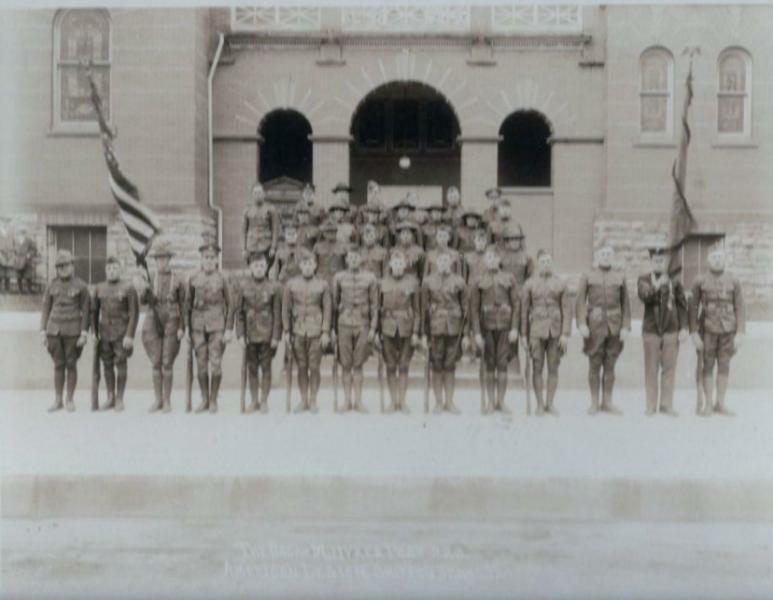 They were: William Clyde Ashwell, William H. Durff, Oscar M. Hykes, Morrow Brown, Charles Newcomer, Robert Price, Willis Coleman, Calvin Lee Shoap, and John Smith. 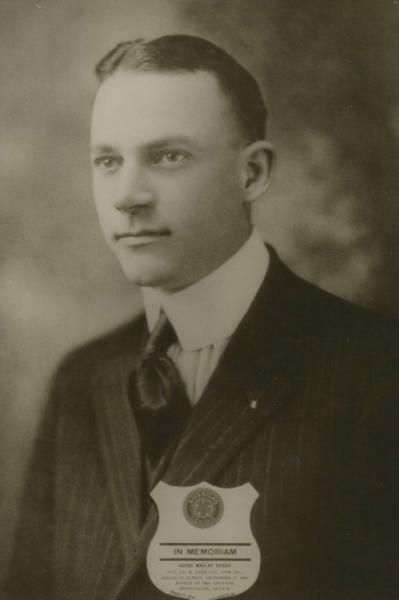 The American Legion Post #223 was named for Oscar M. Hykes, the son of the later Mr. and Mrs. George E. Hykes formerly of 48 West King St. He was trained at Fort Lee, Va and then was assigned to H Company of the 146th Ohio Infantry Regiment of the 37th Division. With this unit he went overseas in June, 1918 He took part in the Battle of Baccarat, the Battle of the Meuse-Argonne, and..
A military funeral was held for Oscar m. Hykes, KIA (killed in action) upon return from France for reburial in Springhill Cemetery. A Ladies Auxiliary to the Oscar M. Hykes Post was formally organized. The ladies had demonstrated their interest in the post during previous months by helping secure the equipment, piano, and rugs for the meeting room. The first American Legion baseball team was organized and a season of games with other teams scheduled. 1922 August 15 The American Cemetery in France 125,000 Graves. This photo has been restored and the original is in a climate controlled safe at Post 223. 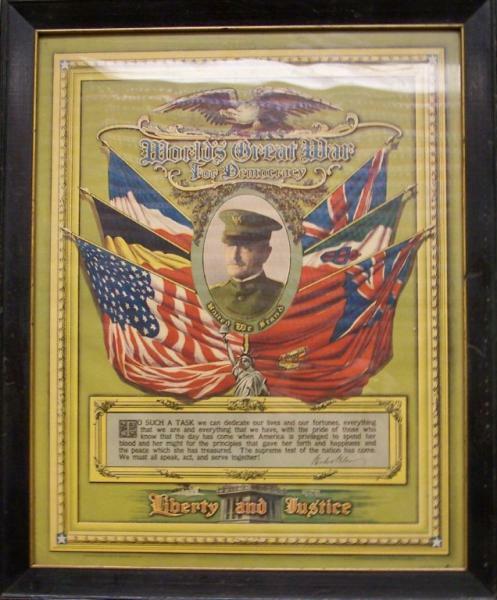 The original was donated to the post by the first Post Commander, George H. Stewart August 15, 1922. Ten rifles were purchased and a case constructed for their care. 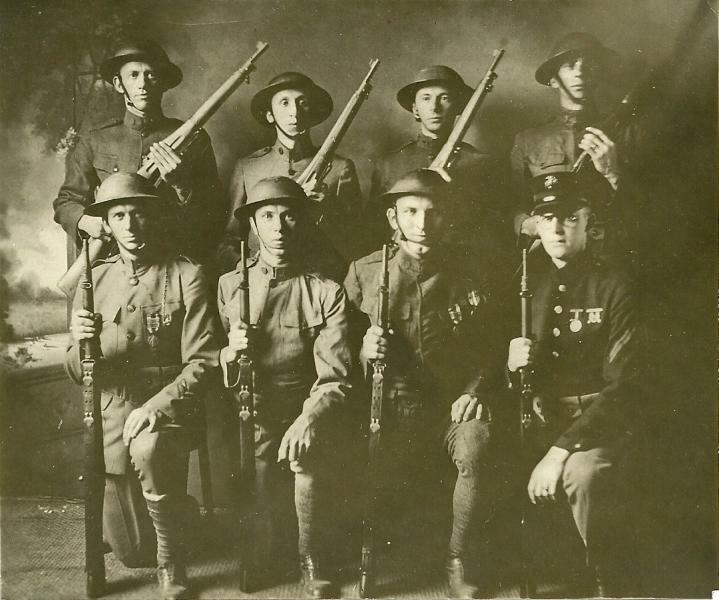 A rifle squad was organized so that the members could participate in all patriotic and memorial services. A resolution of condolences was passed by the post and sent to Mrs. Woodrow Wilson, regretting the death of her husband. President of the U.S. during WW!. Shippensburg has never fallen down when it came to answering a call for help. 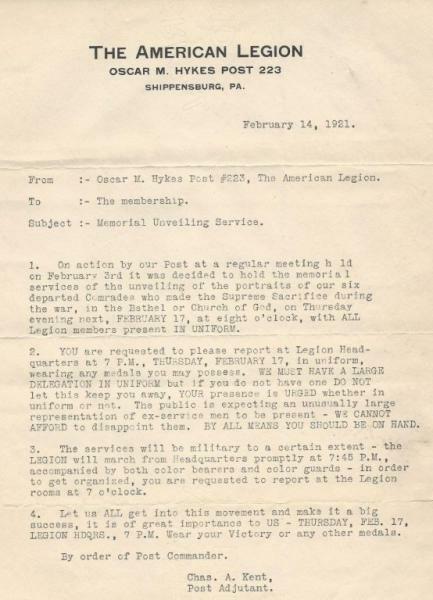 The latest call came from the Oscar M. Hykes Post, American Legion, and was for a contribution of $1,800, being our quota for a $ 5,000 Endowment Fund to take care of the orphans of World War soldiers. The appeal for help was not in vain, Shippensburg subscribed its full quota.